Our first visit to Slovenia was in the fall of 1996. When leaving, as our bus crossed the border into Italy, we promised ourselves that we would return as soon as possible. Discovering Slovenia had been a major find for us. The beauty of the country and the hospitality of its people had made a lasting positive impression that made us hunger for more. Much to our regret, we are still reminded that there are many people in the world who are not familiar with this small haven of peace, security and tranquility. Perhaps President Clinton's recent visit and strong praise of Slovenia's rapidly growing democratic strength in the southern central Europe region will help the world to recognize its existence. Slovenia is a country of more than two million inhabitants bordered by friendly neighbors; Austria in the north, Italy in the west, Hungary in the northeast and Croatia in the east and south. There is something for everyone and with more than 50% of the country covered by forests, the environment is wonderfully clean. (And speaking of clean, everyone and every place are as clean as you will find anywhere in the world.) If you like mountains, lakes and parks, the Julian Alps region with Lakes Bled and Bohinj and the Triglav National Park is an unbeatable destination. Slovenia produces outstanding wine but unfortunately most of it stays at home because of limited production. It's worth a trip along the wine route not only to appreciate the grape but also to enjoy a delightful way to see the country. Along this route you'll also find another of Slovenia's riches, their health water wells and thermal spas. The Karst region is famous for its thousands of subterranean caves, twenty of which are open to visitors. The best known is the Postojna Cave and Skocjan Caves. If you love the sea, the Adriatic coastline has a variety of attractions. You can travel by train and bus, as we did on our first visit, or preferably by automobile, as we did this time. If you prefer cycling, there are wonderful route suggestions available through the Slovenian Tourist Board and the local tourist offices. We will list email addresses for various tourist offices at the end of this travelogue. But first, let us spark your interest and share our enthusiasm. We flew from Paris with Adria Airways on a very comfortable Canadair Regional Jet. The airline has three of these planes plus three new larger aircraft and offers excellent connections to all major European destinations via the airport outside the capital city, Ljubljana. We had good size leather seats with plenty of legroom and the quality of the service was outstanding. When we had planned our first trip via the Internet in 1996, we had the good fortune to meet Rok Klancnik, Manager of Communications of the Slovenian Tourist Board. He was enormously helpful in supplying us with detailed information and planning our itinerary. We have stayed in touch over the years as we regularly forward to him the requests that we receive from readers of TheTravelzine.com in need of specific up-to-date information. Rok always responds to these requests immediately. Once again, Rok worked with us to plan a route that would expose to us more of Slovenia's treasures. If you've got a week to spare - have we got a plan for you! We flew into the small, very efficient Brnik Airport and proceeded to ABC Rent-A-Car. If you like family-run hotels and restaurants (as we do), you will like ABC. The Karun family started the business from scratch at about the same time Slovenia declared its independence and the company has grown as the young democracy has flourished. Matej Karun greeted us like visiting family, provided us with great maps, carried our bags to the waiting car and made us promise to call him if we needed any help. Welcome back to Slovenia. The thirty-minute drive into Ljubljana was picturesque and easy. The Hotel Slon, Slovenska 34, was again our choice. It is perfectly located in the center and is an excellent value, four star establishment. As in most of the hotels in Ljubljana, the rooms had been renovated during the past few years with quality, tasteful furnishings and updated bathrooms. Our room had a nice size foyer leading to a very large bedroom area with a king-size bed plus a large bathroom. With CNN on the television and air conditioning that worked, we were very happy campers indeed. The included buffet breakfast is incredible. You can make healthy choices or pack in the cholesterol (or some of both). Everything is top quality, well prepared and maintained efficiently and carefully. We love this city. It is the heart of the country; a heart that beats strongly with warmth and grace. It's the kind of place that you just want to stroll, while holding hands with your loved one, and enjoy the rich life and beauty all around you. It didn't take us long to do just that, seeking out the sights we had missed before. As we were leaving the market place and passing the cathedral, we were entranced by the magnificent carved side door depicting the history of the Ljubljana Diocese which was done in honor of the Pope's 1996 visit. 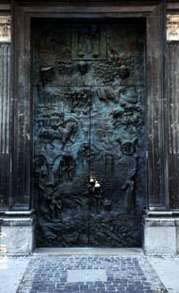 At the front, we again were struck by the main door, made of bronze and sculpted to represent 1250 years of Christianity in the country. Nearby is the Bishop's Palace, which has a beautifully preserved, arcaded courtyard. This was our day for courtyard discoveries. At the rear of the Town Hall is a great one with pillars, balconies, stone, marble, stucco, hand painted walls, paintings - a bit of everything that together creates a gorgeous aggregate. There's an area where sculptors lived and worked and the nearby little church that is filled with sculptures from these artisans. Unfortunately the church is undergoing renovation but we did manage to peek in at its simple beauty. Our last new find was the Roman wall, where the southwestern sections of the walls of antique Emona have been preserved. This capital city has so much diversity that it is a feast for the eyes and the senses. The old town is a treasure of baroque influence. Preseren Square is a hub of activity as the adjoining gorgeous Triple Bridge across the Lubljanica River is the major crossing to and from the old town and the market place. Sit here at one of the outdoor cafes, enjoy coffee, pastries, and ice cream and watch all of Ljubljana pass by. The market place, smelling deliciously of fresh herbs, flowers, produce and fabulous, freshly baked breads and pastries will challenge you not to partake. It's refreshing to walk along the banks of the river enjoying the willow trees and the views of the bridge crossings or just sit on a bench for a quiet rest. When you leave the old town and cross the river, it becomes a new experience. The compact center of the city is like one great square, within which are individual squares, linked by intersecting streets with many private galleries, concert venues and experimental theatres. The corner posts of this great square are the National Theatre, Philharmonic Hall, National Library and National Museum. Also within the area are the Cultural and Congress Centre, the Opera House and the Museum of Modern Art. We enjoyed it before, we love it now and we'll be back for more. Speaking of enjoyment, we were fortunate that Rok was free to join us for dinner along with beautiful and charming Nina. The restaurant was Spajza located in the old town at Gorjni trg 28. It was a lovely evening so we sat outside on the lovely terrace; the interior small rooms are comfortable, casual and intimate. Rok is a charming and gregarious fellow with robust energy and a wealth of information on just about any subject or issue we chose to discuss. I bring this up here because he and Nina are representative of the new generation of Slovenians that are building this country into a vibrant and productive society. Meeting many of these young people was the "human" highlight of this trip. They are well educated, industrious, confident and determined to build a bright future for themselves and their country. The conversation was stimulating and the food superb. It would have been easy to make a meal of the delicious herb and nut breads. Our starters, asparagus and eggs and arugula with Parmesan cheese and walnuts drizzled with olive oil, were just right. We shared medium rare beef slices on arugula and tender, young roasted goat and potatoes. The huge array of herbs we saw at the market had found their way to this kitchen, and were then skillfully used to transform ordinary into extraordinary. The Slovenian wines are truly wonderful and we thoroughly enjoyed a light fruity Cabernet Frank from Kren. It was berry season, so it was essential to finish with a wild berry chiffon pie topped with real whipped cream - light and lovely! We made a date to have dinner again when we returned for our last day before flying out to Zurich. Leaving Ljubljana, we drove Southeast to Kocevje only 60 km away. The roadway was excellent (as were all the roads we traveled) and the driving easy. It was a bright, sunny day and we could appreciate the rolling, green hills covered with trees and the beautifully kept farms and homes that are so reflective of the pride of the people. We had a date to meet Ms. Jana Konecnik of the local tourist office at the Hotel Valentin in the town center. 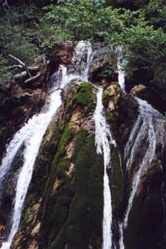 Our primary reason for visiting this region was to see the Virgin Forests. There are six of these forests in the Kocevje region. Jana's father works with the Kocevje Regional Unit of the Slovenia Forest Service so she knows the area intimately and was a perfect guide. Actually she is perfect in many ways. She is a personable and intelligent college student who works part time with the Slovenian Tourist Office on various assignments. She is one of that growing army of young people working to propel Slovenia into the new millenium.
" Virgin forest reserves form a protected natural heritage where no living trees are felled and no dead trees taken away, where mushrooms and flowers are not gathered and where the silence is not disturbed. We simply surrender to nature. Forest reserves are marked with blue color and it is possible to walk only to the edge of the Virgin Forest on marked paths ". This from the literature provided by the local tourist office. Giant trees grow to a height of fifty meters, measure over 1.5 meters in diameter, carry up to 50 tons of wood mass and live to an age of 500 years or more. Primarily bears, lynx, wolves and eagles inhabit the forests. It's an amazing experience to wind through the paths and to be surrounded by this much pure nature. It's hard to resist the desire to hike off into the woods. There is a proposed regional park with hiking trails in the planning stages. We drove along the Kolpa River whose multi-faceted nature invited you one minute to enjoy a swim in its peaceful and calm waters and the next was a raging torrent more suited to a kayak race; certainly an inviting venue for fisherman and camping enthusiasts. The Kostel Castle sits on top of a high pointed hill with a unique view of the valley and the river below. It's location always caused great trouble for invaders. This is a region of castles that had historically provided a first line of defense. The education system is excellent in this country and as we passed through the tiny village of Fara, we saw more evidence of this. Jana pointed out a school with dormitories where young children came for one-week visits to study nature. Jana's father had figured that we would be ready for lunch by noon and had suggested to Jana that we stop in the village of Mozelj at the Restaurant Fajfar. The owner, a sweet caring woman who only wanted to please, warmly greeted us. We suggested to her that she decide our menu, which she was happy to do. The wood ceiling, pillars and trim combined with the garden and forest out back gave us a nice country feeling and appetite. We started with wonderful mushroom soup. A perfectly grilled, tasty turkey steak was served with two typical Slovenian specialties; struklji, a dumpling filled with cheese and a thick, round slice of alternating rings of baked mashed potato, ground meat and carrots. A delicate mushroom sauce was served on the side to be used as desired. The crunchy, mixed salad from the garden out back was fresh and delicious. It was a real homemade meal prepared by a lovely lady. She blushed with pleasure when I gave her hug and kiss good-bye. Although she spoke no English, she understood that her cooking and her warmth were appreciated completely. Back in Kocevje, we said our good-byes to Jana. We headed northeast to Novo Mesto, the capital of the Dolenjska region, to meet Lidija Mavretil, the Marketing Manager of the Dolenjska and Bele Krajine regions. Lidija was kind enough to spare some time to tell us about these regions, which she did with gusto. This is a significant wine-growing region and having grown up working in her family's vineyards, she knows and truly loves this land. Proud, smart and ambitious, Lidija will help to drive Slovenia forward. We had bad luck visiting Novo Mesto. First, it began to pour and second, we were too late for the market, which is held every Monday, Wednesday and Friday from early morning until noon. We did see enough to inspire us to return some other time. The old town sits high on a rocky hill above the River Krka. The main square is quite large with arcades, shops and municipal buildings lining its sides. The splendid Collegiate Church dominates this old part of town. Despite the rain, we had a nice feeling that this well-kept town would be a friendly place to linger. After spending time with Lidija, we got that feeling about the entire region and regretted we had not allotted enough time to explore it all. We will be back.